The key word here is “maintaining.” Because there are specific ways of preparing raw foods, as well as certain equipment, many people would find it challenging to sustain a high raw foods diet over a prolonged period. While there is nothing that I have personally experienced like the raw food diet that can almost miraculously transform a number of chronic food allergies and other health issues, I am also keenly aware of the human need for comfort, convenience and camaraderie in their healthy recipes – as well as getting certain cravings satisfied. Over the years I have found ways to integrate the two lifestyles in very appealing combinations.. My first easy recipe offering is deceptively simple, yet everyone who has tried it is astounded by the tantalizing variety of tastes and textures of flash-sauteed veggies served over greens, which become semi-wilted and ultra-delicious. Although other oils can be used for flash-sauteeing, there is none that imparts such a rich and nutty taste as virgin coconut oil cooking. 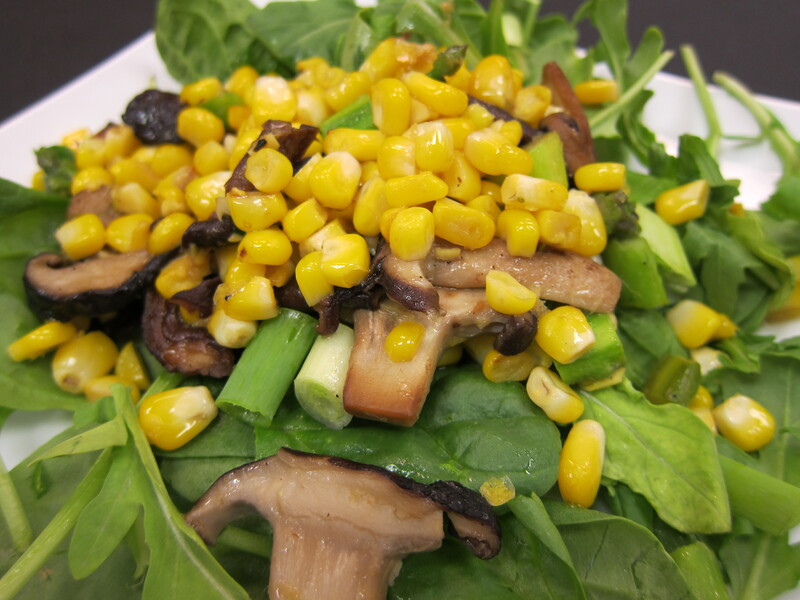 Buy fresh corn on the cob for this dish and whenever possible, from organic sources so that you can be confident that it is not genetically modified. Divide spinach and arugula leaves among the serving plates. Cut away the kernels from each cob and reserve. Break off bottom of each asparagus stalk – if they are the thin kind, chop into ½ inch pieces. If these are the thicker stalks, peel up from bottom to remove fibrous skin. Then chop into small slices. Tear or cut shitake caps into small pieces or slices, use stems if they are not withered. Heat coconut oil for cooking in a wok or deep frying pan – starting with the shitakes, brown them slightly. If using fresh garlic, add it now. Add more coconut oil if needed. Toss in the asparagus and quickly sauté, then the corn, adding the garlic granules or powder and salt to taste. Cooking time should be short for these 2 ingredients in order to maintain their essentially raw state. 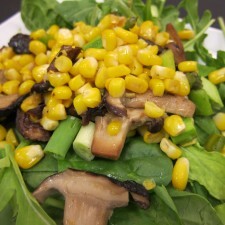 Spoon warm vegetables over the greens, including any of the remaining coconut oil.